HARGEISA, SOMALILAND: The Somaliland Ministry of Water and Mineral Resources will open the country's first bid round for hydrocarbon concessions today, Feb. 19. The bid round will include eight concession blocks comprised of more than 34,604 square miles (89,624 sq km) of onshore and offshore areas. The deadline for bid submissions is August 15, and the concessions are expected to be awarded on Dec. 15, 2009. 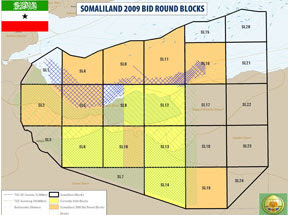 One hindrance to the bid round could come from the fact that Somaliland has not been recognized as its own country, but rather still a part of Somalia. 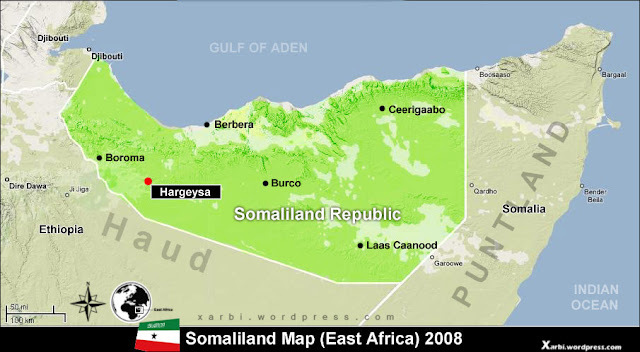 Somaliland, which is located in the Horn of Africa, bordered by Ethiopia, Djibouti, the Puntland region of Somalia and the Gulf of Aden, withdrew from Somalia in 1991 and has maintained a de jure separate status since that time. However, without international recognition, oil and gas companies may be hesitant to sign long-term contracts and invest money into projects that could possibly become void if the political situation in Somaliland changes in the future. The geology off the coast of Somaliland is analogous to the oil-producing basins in nearby Yemen that have yielded several discoveries. Yemen's Balhaf Graben Basin and Somaliland's Berbera Basin contain similarities in fault trends and structural complexity. In preparation for the Somaliland licensing round, TGS-NOPEC Geophysical Co. ASA acquired 3,293 miles (5,300 km) of seismic, gravity and magnetic data in the offshore areas and 21,562 miles (34,700 km) of high resolution aeromagnetic data covering all known petroleum basins. The surveys mark the first new geophysical data acquired in the area in almost 30 years. The data acquisition was completed in 2007 and 2008, and TGS used this data along with existing well logs and interpreted data to create comprehensive interpretation reports for the Ministry. The reports, as well as the newly acquired geophysical data and well logs are all multi-client products to be exclusively marketed by TGS on behalf of the Ministry. Somaliland's Minster of Water and Mineral Resources Qasim Sh. Yusuf Ibrahim said, "The previous drilling has proven the existence of hydrocarbons and the reservoir class rock formations. With the help of the new geophysical data we can now map the structures needed to identify where the hydrocarbons are trapped."